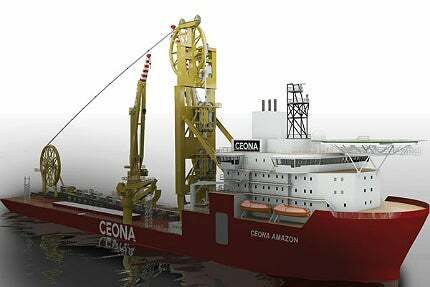 Ceona Amazon is a DP2 multifunctional pipelay and construction vessel delivered in December 2014. The contracts for the construction of Ceona Amazon were awarded to Lloyd Werft Bremerhaven in July 2013. The steel cutting ceremony for Ceona Amazon was held in July 2013 at Crist's Gdynia facility in Poland. Ceona Amazon, a new multifunctional pipelay and construction vessel built by Lloyd Werft, was christened at Columbus Cruise Terminal in Bremerhaven, Germany, in December 2014. The final installations were completed in February 2015. The vessel is based on a drill ship design and is capable of operating in remote locations and adverse environments. KfW IPEX-Bank and ABN AMRO provided $290m of secured debt facility to finance the construction of Ceona Amazon and a pipelay system for another new build, Polar Onyx. Ceona Amazon complies with the ‘special purpose ships’ safety code (SPS Code) and is equipped with a DP2 dynamic positioning system. Design works for the vessel started in January 2013 and the first steel was cut in July 2013. The hull of the vessel was assembled at Crist’s Gdynia facility. It floated out of the Crist yard in Poland in April 2014, from where it was towed to Lloyd Werft yard in Bremerhaven, Germany in October 2014 for its final outfitting. The pipelay equipment aboard the vessel was installed by Huisman in Schiedam, the Netherlands, in February 2015. "The hull of the vessel was assembled at Crist’s Gdynia facility and the outfitting was done at Lloyd Werft Bremerhaven." The dynamically positioned pipelay and construction vessel has an overall length of 203.1m, a breadth of 32.2m, an operational draught of 8m and a gross tonnage capacity of 31,240t. The main deck of the vessel covers an area of approximately 4,600m² with a main deck loading capacity of 16t per square metre. With a loading capacity of 5,500t, the vessel’s under deck also provides ample space for storing pipes and connecting components. The vessel is required to lay fixed and flexible pipes on the seabed at a water depth of approximately 3,000m. It lays the pipes through a moon pool and the pipes are fed continuously from the cargo hold. The facilities aboard the vessel enable it to operate without land support most of the time. Ceona Amazon is capable of accommodating 200 skilled personnel in 88 double cabins and 26 single cabins of high-standard comfort class. The vessel is fitted with two 400t heave-compensated mast head cranes, one on the aft and the other on the middle of the vessel, including a 30t heave-compensated knuckleboom crane. The vessel is capable of laying umbilicals, rigid and flexible pipelines, as well as installing large subsea structures using one or both of its 400t cranes in tandem lift mode. It does not require a spool base to support its operations as it can be remotely operated. The vessel’s pipelay system comprises of an inclined multilay system with a top tension of 570t and a rigid pipeline firing line system. It further features one abandonment and recovery (A&R) winch with a pulling capacity of 600t and another A&R winch with a pulling capacity of 125t. The carousel measures 18m in diameter and is capable of handling equipment weighing up to 3,500t. The lay system further comprises an ILS tower crane with a lifting capacity of 15t and 12 flexible reels rated at 250t each. The vessel is further equipped with two work-class type remotely operated vehicle (ROVs) capable of operating at a maximum water depth of 3,000m. They are assisted by auxiliary launch and recovery systems (LARS). A helideck for Sikorsky S-92 with a D value of 22m, complying with CAA – CAP 437 and HELDK standards and regulations, is also featured on the vessel. "The vessel lays fixed and flexible pipes on the seabed at a water depth of approximately 3,000m." The vessel is equipped with two 9L32/44CR and four 8L32/44CR main gensets with a combined output of 28MW. The 32/44CR engines have a 320mm bore and 440mm stroke. The vessel is further equipped with seven thrusters. MAN Diesel & Turbo built the engines at its Augsburg production facility in southern Germany and carried out an electrical test at its Frederikshavn site in Denmark prior to delivery. The vessel is capable of sailing at a speed of 15kt. L-3 SAM Electronics supplied complete electrical packages, including navigation, automation, communications, energy distribution and propulsion systems for the pipelay vessel. In November 2013, Pipeline Technique Ltd (PTL) was awarded a three-year welding contract to deliver pipeline production services management, which includes engineering and offshore welding on both carbon steel and exotic rigid pipes from 4in to 16in in diameter and non-destructive pipe testing onboard the vessel. Toisa, a marine services provider, contracted Hyundai Heavy Industries (HHI) in February 2013, to construct a multipurpose offshore construction vessel (MOCV) based on the X-Bow hull design. Leicon CTV9 is the first of two new crew transfer catamarans built by Evolution Commercial.